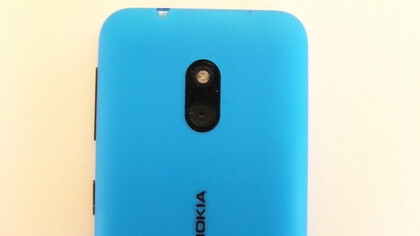 The Nokia Lumia 620 is Nokia’s third foray into Windows Phone 8 territory, but while the previous two – the Nokia Lumia 820 and the Nokia Lumia 920 – were both fairly high end affairs, this is a decidedly budget handset. 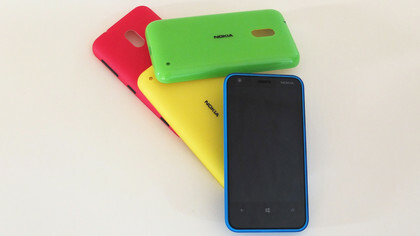 The Nokia Lumia 620 has a fairly small 3.8-inch screen while the HTC Windows Phone 8S has a marginally bigger 4-inch one, but on the other hand the Nokia Lumia 620 has 8GB of internal storage while the HTC Windows Phone 8S only has 4GB. Essentially they’re pretty similar on paper. The big difference is the price, since the Nokia Lumia 620 is being sold for a temptingly low £150 (around AU$225/US$235) if you get it on Pay As You Go in the UK – free on monthly UK contracts from £17 (around AU$26/US$27) per month. Or it’s £229.99/AU$299 (around US$360) SIM-free. That alone is a huge selling point, and for entry-level buyers who want to try Windows Phone 8 it’s positioned itself as pretty much the only choice, that is assuming the performance can match the HTC Windows Phone 8S. 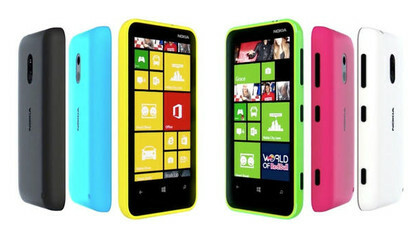 Following Nokia’s recent trend, the Lumia 620 is colourful – very, very colourful. There are loads of colour options for the back of the phone, but whether you plump for a yellow, red, blue, green or something else altogether you can be sure it’ll be bright. You can also easily swap between covers, so if you want you can have a different colour every day of the week, or even change it multiple times a day just to confuse everyone. 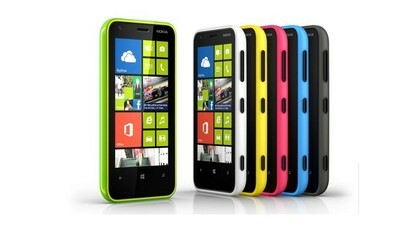 As well as looking colourful, the Nokia Lumia 620 also looks kind of cheap. With dimensions of 115.4 x 61.1 x 11mm (4.5 x 2.4 x 0.4 inches) it’s small and chunky. It’s also slightly heavier than we expected for a handset of its size, coming in at 127g (4.48oz) compared to 113g (3.99oz) for the slightly larger HTC 8S. It feels decent enough in the hand, the curved edges of the plastic cover are comfortable to hold and because the cover is both quite solid and easily replaceable there’s less fear of dropping it than there is with some other handsets, though the screen is still at risk. 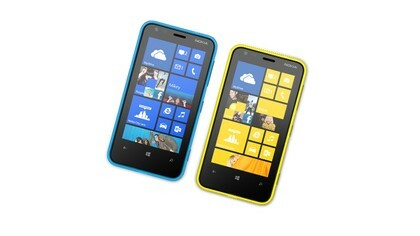 The front of the Nokia Lumia 620 is mostly taken up by the 480 x 800 screen, as you’d expect. At 3.8 inches it’s certainly not the biggest we’ve seen, but it’s a decent enough size for a budget handset. It’s got a fairly reasonable pixel density of 246 ppi too, which while not as sharp as most high-end handsets is still good enough to produce fairly crisp images. Above the screen there’s the earpiece in the centre, the front-facing 0.3 megapixel camera to the left of it and the Nokia logo to the right. Below the screen there’s a slightly larger space with soft touch buttons for ‘Start’, ‘Back’ and ‘Search’. 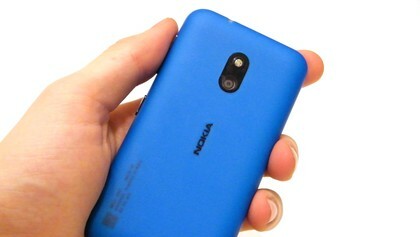 The back of the Nokia Lumia 620 is fairly plain. 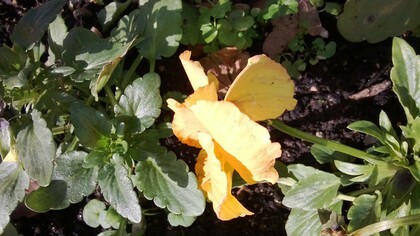 The bulk of it is just a mass of bright colour from whatever back you’ve got on it, but there are a few features. Towards the top there’s the main 5 megapixel camera, capable of shooting 720p video. In the centre there’s another small Nokia logo, and at the bottom-right there’s a loud speaker. 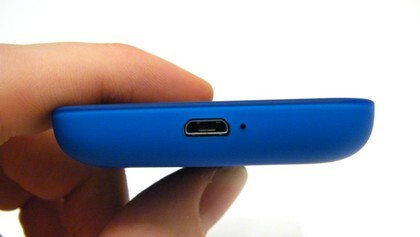 On the top edge you’ll find a microphone on the left and a 3.5mm headphone port on the right. 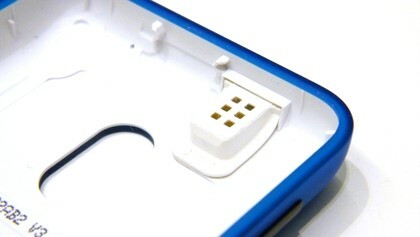 The bottom edge has a micro USB port in the centre for charging the phone or connecting it to a computer, while just to the right of that there’s another microphone. 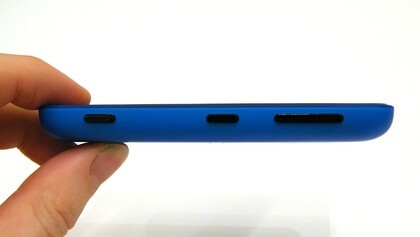 The left edge of the Nokia Lumia 620 has absolutely no ports or buttons on it, while the right edge contains all three of the handset’s physical buttons, specifically a volume rocker at the top, the power/lock button in the middle and a camera button at the bottom. 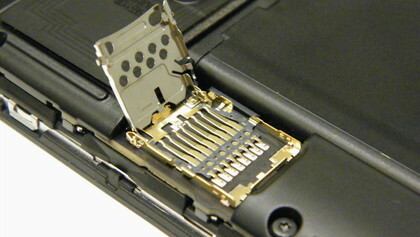 The back cover can be pulled straight off, making it easy to change. 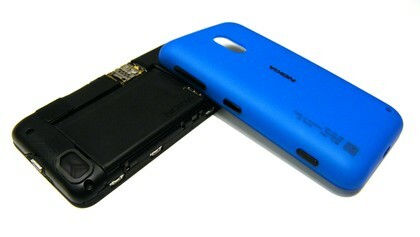 Underneath it you’ll find the 1300mAh battery, while under that there’s the microSIM slot. 1300mAh is a slightly worrying battery size, particularly considering the similarly specced HTC Windows Phone 8S has a 1700mAh battery and still only has a mediocre battery life. 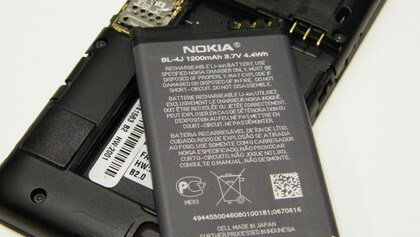 Nokia claims its battery is capable of up to 14 hours and 40 minutes talk time, 331 hours on standby or 61 hours of music, which isn’t bad if true, though notably it doesn’t give an estimate for watching videos or doing other things that require the screen, and these are generally the biggest drain. 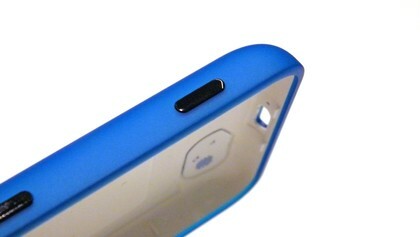 There’s also a microSD card slot under the back cover. It supports cards of up to 64GB and is all but essential given that there’s just 8GB of onboard storage. 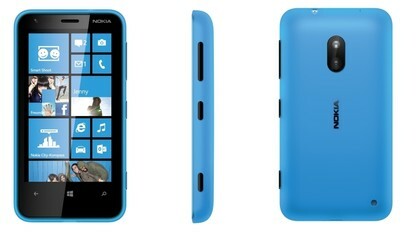 The Nokia Lumia 620 is standard Windows Phone 8 through and through. When you turn it on or unlock it you’re greeted with a lock screen complete with the time, date and battery level overlaid on customisable wallpaper. You can clear it with an upwards swipe and you’ll land straight on the Start screen (or whatever screen you were last on). Microsoft has done a great job with the Windows Phone 8 start screen, making it arguably more distinctive than those on either iOS or Android. Rather than a series of horizontally scrolling screens, Windows Phone 8 scrolls vertically and doesn’t have separate screens – it’s just one continuous stream of apps. It’s not necessarily a better way of doing it, but it’s certainly different from the competition. 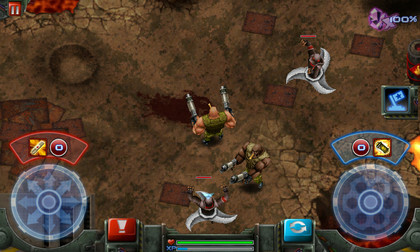 The apps themselves are laid out as tiles, which can be made into any of three different sizes. 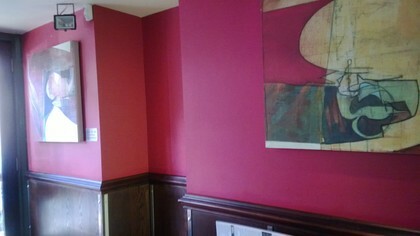 They largely follow a uniform colour scheme (of your choosing) and they slot together elegantly. 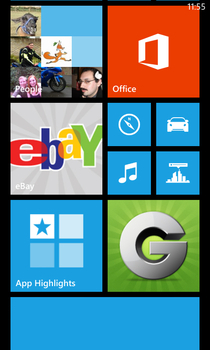 We’ve said it before, but it’s very hard to make the Start screen on Windows Phone look messy or ugly. 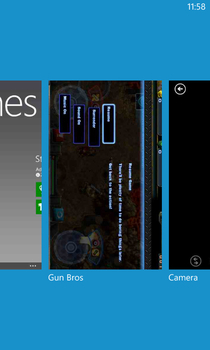 Many of the apps on the Start screen can also have live tiles. Much like a widget on Android, this means that the tiles aren’t static. For example, the People app will scroll through pictures of your contacts and the Calendar app will display upcoming events and reminders – all right there on the start screen. Tapping a tile will open the associated app, while if you want to resize, move or delete a tile you simply long-press it and then either drag it into a new position, tap the size button that appears, or tap the unpin button to remove it from the screen. Aside from doing that and picking a colour scheme for the tiles, the only other customisation option available is picking from a light or a dark background – there’s no custom wallpapers here. The only thing other than tiles on the start screen is the time, which is displayed at the top-right of the screen. However, if you tap the top it will also briefly bring down a battery bar, signal level and list of any active data connections. Swiping right from the start screen brings you to a list of all of your apps, including those not currently pinned to the start screen. You can launch any of them from here by tapping on them, and pin them to the start bar or uninstall them by long-pressing them. This is also where you’ll find the settings screen, though that too can be pinned to the start screen for easier access if you’d prefer. From here you can customise the colour scheme, set up Wi-Fi networks, change your ringtone, adjust the brightness and more. Most of the options are fairly standard and self explanatory, but there’s one that’s worth mentioning – kid’s corner. This enables you to set up a separate user area for children, where you can limit access to certain apps and media. Once it’s set up you can easily get to it by swiping right from the lock screen. The Nokia Lumia 620 isn’t the only phone to have this feature, but combined with the low price tag, robust back and colourful, changeable covers, it makes it a fairly child-friendly handset. That’s about it for the main interface. It’s very simple, and for the most part very intuitive. 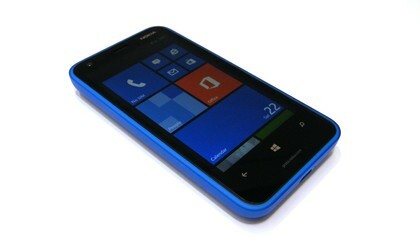 Despite being a low-end handset, the Nokia Lumia 620 also has enough power to make getting around a breeze. Scrolling and swiping on the screen is fast, smooth and responsive, and with a 246ppi display, everything looks fairly crisp and clear. The only other thing to mention is the three soft touch buttons at the bottom of the screen. 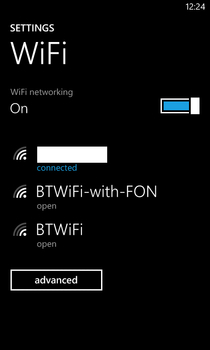 As with most other things on the Nokia Lumia 620, these are a standard Windows Phone 8 feature. But for those new to the OS, there’s a Back button on the bottom-left, which scrolls back through the previous screens and apps that you’ve used. If you long-press it you can even get a visual overview of them all and simply tap on the one that you want to return to. Then there’s a start button in the centre that takes you back to the start screen. Long pressing this one brings up a voice search box. It can be used to do an internet search, open apps or even text or call contacts. Better yet, it actually works. Or it does if there’s no background noise anyway – good luck using it in a pub. 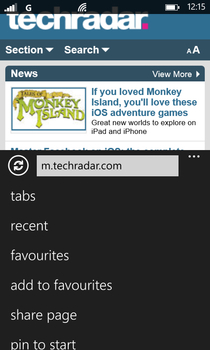 Finally, on the bottom-right there’s a search button; this simply launches Bing and enables you to tap out a web search. All in all, both the interface and performance are pretty comparable to the HTC Windows Phone 8S, which given that the Nokia Lumia 620 can be bought for less money is pretty impressive. 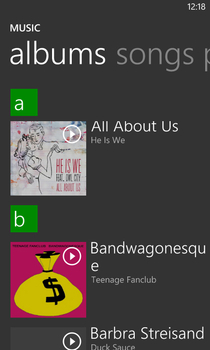 Contacts are accessed from the People tile on the Nokia Lumia 620. There are several screens here, but the one that you start on is ‘All’. As the name suggests, this displays a list of every contact on your phone. It displays them alphabetically with a little picture next to their name. You can import contacts from the SIM card, Facebook and other social networks, so it’s easy to get them on your phone. It will also pull in display pictures of them from Facebook, so you need never have any picture-less contacts. At the bottom of the screen there’s a search button, which enables you to search for a specific contact, and a plus button which enables you to add a new contact. Doing so is straightforward – you simply tap a field, for example ‘name’ and then fill it in. There are a lot of fields you can add too, so if for example you want to keep a record of their office location you can do that. Tapping a contact will bring up any available information on them, be it their phone number, email address, date of birth, status updates or more besides. If you’ve got an email address for them you can send an email by tapping on it, you can call them by tapping on their phone number and even write on their Facebook wall by tapping on the Facebook option. It’s all very intuitive and well integrated. 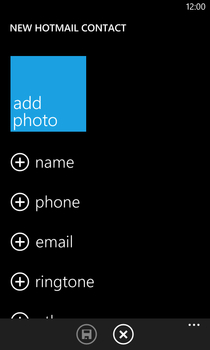 You can also edit a contact’s profile, adding or removing any number of details, or pin it to the start screen. 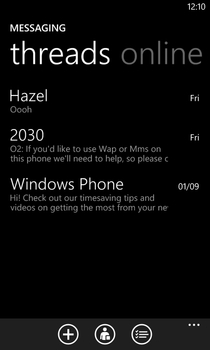 Pinning a contact to the start screen is a great way to get quick access to favourites. Swiping to the left on their profile will show any new statuses or posts they’ve made on Facebook or Twitter, swiping left again will bring up photos of them and a final swipe will bring up a History screen, with logs of calls and texts between you and that person. 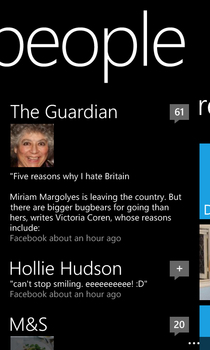 Back on the Nokia Lumia 620’s main People screen, swiping left gives you a similar set of screens. There’s a What’s New screen that shows new posts and events in your social network feeds, a Recent screen, which shows contacts that you’ve recently interacted with, and a Together screen, which enables you to make groups and ‘rooms’. Rooms are a bit like groups – enabling you to sort contacts into specific groups, but it’s more social than that, because in a room photos, calendars and notes can be shared with everyone. You can access a settings menu from any of the main People screens, and this enables you to hide certain contacts, sort the list by first or last name and add new accounts. 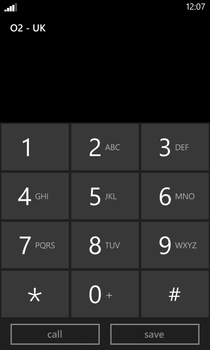 To use the Nokia Lumia 620’s phone function, aside from tapping on a contact’s phone number from their profile, you can also make calls from a separate dial pad. 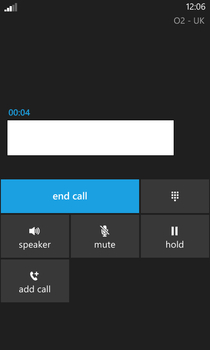 As seems to be standard on Windows Phone, there’s no smart dialling option, which makes the dial pad rather disappointingly limited and something that you would only ever use for calling people who aren’t already in your address book. Aside from the dial pad itself there are several other options here. You can tap a voicemail button to automatically call your voicemail, view your call history (and also call people back by tapping on any calls or missed calls), go to the address book in the People app or search for a specific contact. There’s also a settings menu that enables you to configure your voicemail and set up call forwarding and text message auto-replies for when you can’t answer the phone. When someone calls you, three buttons appear on the screen – one to answer, one to send a text message reply and another to ignore. Unless it’s a landline number, in which case there’s no text message option. When actually on a call you have the option to enable the loud speaker, mute the phone, put someone on hold, end the call or add another person to the call. You can also leave the call screen without ending the call, enabling you to do other things on the phone at the same time. Getting back to the call screen is a simple matter of tapping a bar at the top of the screen. Calls come through loud and clear even in low signal areas, while the speaker phone seemed to have a bit of an echo at times but was clear enough to be usable. 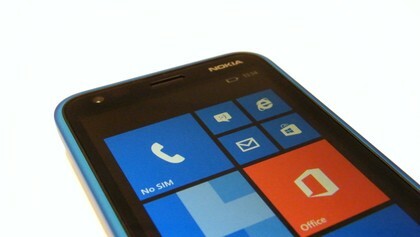 As with Windows Phone 8 in general, the Nokia Lumia 620 handles both contacts and calling with aplomb. It’s intuitively laid out and offers great social network integration. We have two minor niggles – firstly the absence of smart dialling, and secondly the fact that while you can access your contacts list from the dial pad you can’t access the dial pad from your contacts list. But those issues do little to detract from what is otherwise a brilliant setup. We don’t want to oversell it, though – it’s great at this compared to many handsets running other operating systems, but no better than any other Windows Phone 8 handset. 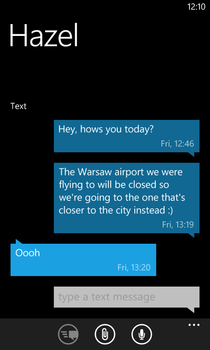 The text message tile houses the main messaging hub on the Nokia Lumia 620. From here you’re presented with a list of message threads, complete with a snapshot of the last message sent or received in each thread and the time or date that the message was sent. It’s sorted by most recent, and tapping on a thread will open it, bringing you to a conversation-style thread of messages, each appearing in a speech bubble. Messages from you appear along the right of the screen, while messages from the person you’re communicating with appear along the left and in a slightly different colour (the actual colour depends on what you’ve set as your colour scheme). You can scroll up and down through every message ever sent or received from a contact, while long-pressing a message enables you to copy, forward or delete it. A white text entry box at the bottom of the screen enables you to tap out a new message. And just below that there are options to delete the whole thread you’re viewing, attach a picture, video or contact card to a message or to speak a message rather than typing it out. As with the voice search, it works pretty well in general, but only if you’re in a quiet environment – any background noise will throw it off completely. Back on the main messaging screen there are a few things you can do other than going into an existing thread. There are three icons at the bottom, the first of which enables you to type a new message, which is necessary if you’re sending a message to someone that you don’t already have a conversation thread for, or if you just don’t want to scroll through all of your threads to find them. The second icon enables you to sign in to or change your status on Windows Live Messenger and Facebook chat, while the third icon enables you to select threads that you want to delete. At the far right there’s a little icon for accessing the message settings screen. 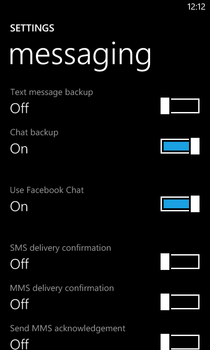 This gives you options to back up texts, turn Facebook chat on or off and enable delivery confirmations on texts. If you scroll right from the threads screen you’ll come to a list of any online contacts, and from there you can instant message them. 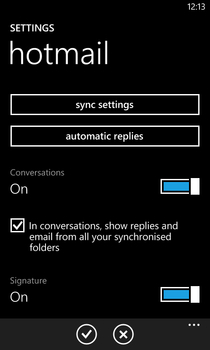 Aside from text messaging and instant messaging, you can of course also send and receive email on the Nokia Lumia 620, and this is handled by a separate email app. It’s laid out in much the same way as on many other Windows Phone 8 apps – the first screen is your inbox, with just a list of all your emails, which you can tap on to read or long-press to move or delete. Swiping sideways will bring you to a list of unread messages, another swipe will bring you to flagged messages and finally one more will bring you to urgent ones. 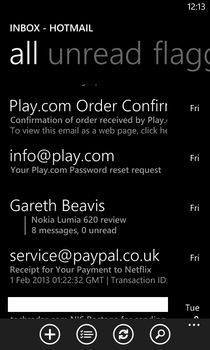 Tapping the plus button at the bottom of any of these screens will enable you to compose a new email. This is utterly straightforward – you can add contacts from your address book if you’ve got an email address for them, otherwise you type one manually. Then type a message, tap the paperclip at the bottom of the screen if you want to attach something and then send it. To the right of the plus button there’s an option to select emails you want to delete, to the right of that there’s a refresh button and to the right of that there’s a button that enables you to search your email. Finally, as usual there’s a settings option at the bottom-right of the screen, which enables you to view different folders, add another email account and change your sync settings. Reading emails works well. They’re automatically fitted to your screen, though if you prefer you can pinch or double-tap to zoom in, and you can easily delete a message or reply to it at the touch of a button. 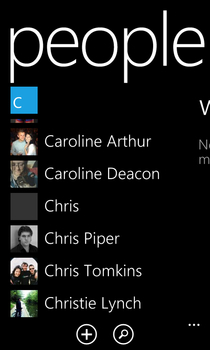 To make things even simpler you can also text, email or instant message people from their profile on the People tile. It’s all very well linked up. 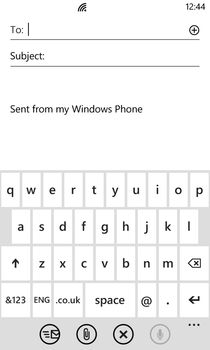 Whether emailing or texting, you’ll need to use the Nokia Lumia 620’s on-screen keyboard, and this is a little bit of a weak link, since it’s just ever so slightly too small and cramped. It’s not too bad; it’s very responsive to taps and does a reasonable job of auto-correcting what you type, but the small size of the keys does lead to mistakes. Thankfully the problem is mostly limited to portrait mode – turn your phone to landscape orientation and the keys become a little bigger and easier to use. 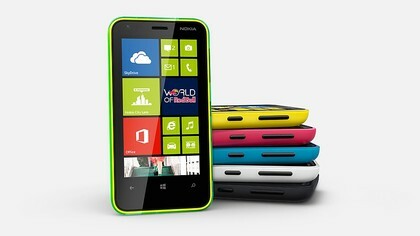 Internet is kind of hit and miss on the Nokia Lumia 620. 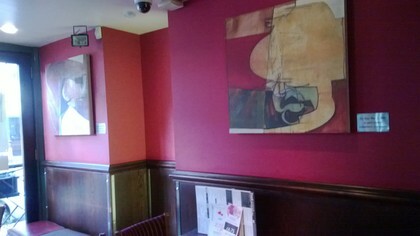 In terms of connection options, you get dual-band Wi-Fi 802.11 a/b/g/n, HSDPA at 21Mbps and HSUPA at 5.76 Mbps. 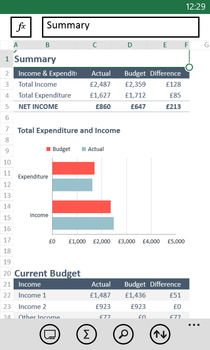 If you stick to mobile versions of sites – which you’ll probably generally be happy to do, given the small size of the screen, then things work well. Sites load almost instantly over Wi-Fi and within a few seconds over 3G. The problem is that not all sites have a mobile option, and even when they do the mobile version is often missing features, so you inevitably have to head to desktop sites, which often slow things down considerably. Over Wi-Fi, a desktop site can take 20-30 seconds to load, and it’s even slower over 3G. Thankfully it loads it a bit at a time, so you can start browsing before it’s finished, but it’s still entirely too slow. Once a site actually does load it fits to the screen and scrolling around it is smooth, though if you need to zoom in (and you will on a desktop site) it seems to take a couple of seconds to refresh the page. Both text and images are fairly sharp, making for a decent browsing experience in that sense. The default and pretty much only available browser is Internet Explorer, which is OK, but certainly not our favourite mobile browser. There’s a persistent search bar at the bottom of the screen, which can also be used to enter full URLs. To the left of that there’s an option to refresh the page, and to the right of that there’s a button that brings up a menu with all the other options. These include opening a new tab (or switching between tabs), viewing your favourites or adding the current page to them, sharing the page, pinning it to the start menu or accessing the main browser settings screen. Having all of these options tucked away on a pop-up menu is understandable given the small size of the screen, but it does make certain actions a bit more of a chore than they should be. 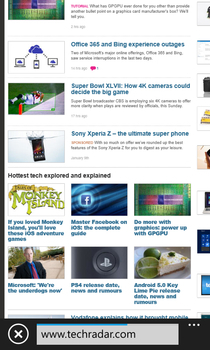 For example, it would be nice to be able to access favourites and tabs from the main browser screen. The actual settings screen doesn’t give you a whole lot to play with. You can block cookies, change the default search provider, delete your history and default to desktop or mobile sites, but that’s about it. It’s a basic but functional browser, it’s just a shame there aren’t any real alternatives. You can download other browsers from the store, but with only a handful on offer (and none of the big names) it doesn’t do much to help. 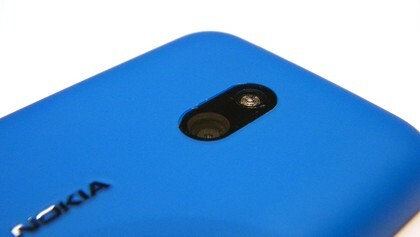 The Nokia Lumia 620 comes with a 5 megapixel camera. That’s in line with other phones in this sort of price range, such as the HTC Windows Phone 8S and the Samsung Galaxy Ace 2, so it’s bang on what we expected in that sense. There are a respectable number of settings that you can customise to your liking, with exposure, ISO and white balance all adjustable. 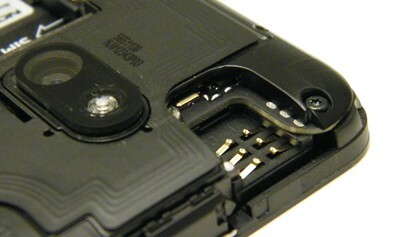 There’s also a flash, autofocus, and a few scene modes such as ‘Night’ and ‘Close-up’. 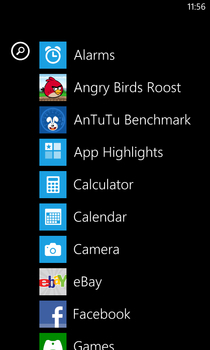 As with other Windows Phone 8 handsets, there’s also a selection of ‘lenses’. These can do any number of things really, from QR scanners, to AR overlays, but most of them need to be downloaded from the app store. You also get a 0.3 megapixel front-facing camera, and thanks to the dedicated camera button that all Windows Phone handsets rock, taking pictures is a breeze. That said, with just 5 megapixels to play with on the main camera, the quality isn’t great enough to threaten your compact camera. 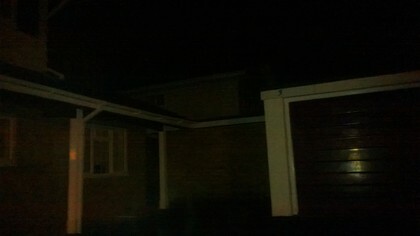 But considering the price of the handset, its photo-taking capabilities aren’t bad at all. 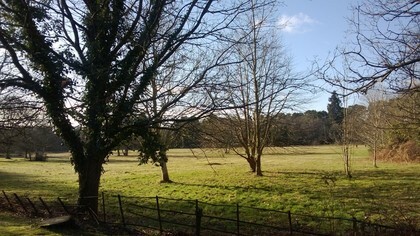 The video camera on the Nokia Lumia 620 is rather more limited than the stills camera. Capable of shooting in 720p it, like the photo camera, is pretty typical of a phone in this price range. However, there are rather fewer options to play with when recording videos than when taking photos. You can change the white balance, the video quality, set whether to have the lamp on or off and whether or not to enable continuous focus, but there aren’t any scene modes. Options aside, the results when shooting video are reasonably decent, and while they don’t particularly stand out, they are easily comparable to 720p footage shot on many other phones. 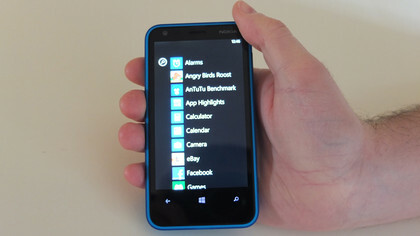 Just about all of your media needs are covered by a single app on the Nokia Lumia 620, specifically the Music + Videos app. If the name didn’t give it away, all of your music and video files are accessible from here. When you open the app it takes you to what it calls your Collection, from which you can pick Music, Videos, Podcasts or Store. 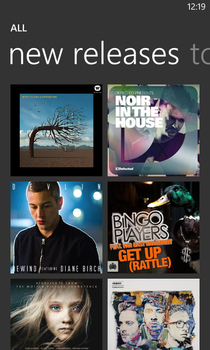 Alternatively, if you swipe left or right you can view a history of things you’ve watched or listened to in the past, see what media has recently been added or view spotlighted artists on the Xbox Music Store. The music player can filter your library by artist, song, album or genre, or you can listen to and create custom playlists. Once you start playing a song, you can view album artwork for it, favourite it and repeat or shuffle it. Those are about all the options you have from the player itself. Strangely, while it is possible to change the equalizer settings, this doesn’t seem to be doable from the music player. Instead you have to go into the main settings screen, scroll down to audio and do it from there, which is a bit clunky. 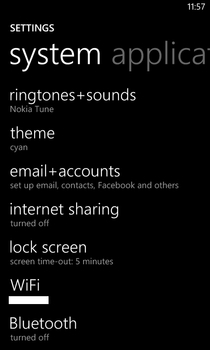 There also aren’t any start screen controls for music, but you can pause or skip tracks from the lock screen. If you’ve got a decent pair of headphones you can get some pretty good audio quality through them. On the other hand, the internal speakers – while impressively loud – are also quite tinny. 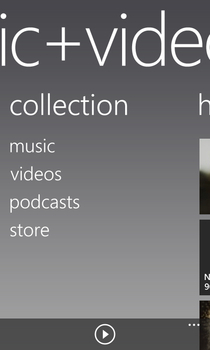 The Xbox Music Store is pretty well stocked, so it’s easy to buy new songs and add them straight to your library. Prices tend to be around 99p (around AU$1.50/ US$1.55) per track, which isn’t the cheapest around, but it’s not extortionate either. Alternatively, you can always plug your phone into a computer and copy songs across if you’d rather get music from elsewhere. 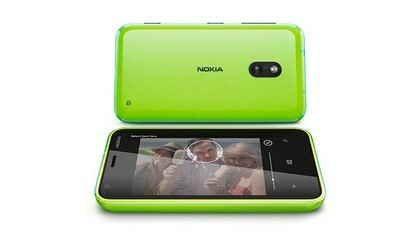 Nokia also has its own music player app simply called Nokia Music. Its layout is almost exactly the same as the main player, but as well as listening to your own music on it you can also listen to mixes free of charge. 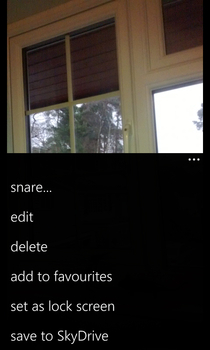 The video player in the Music + Videos app is pretty basic – you get thumbnails of your videos and tap one to play it. Once in you can pause it, skip ahead or skip to the next video, but that’s it. Then again for the most part that’s probably all the options you really need. As with music, the audio is loud but tinny through the internal speakers, so you’ll probably want to use headphones. While the screen isn’t the best we’ve ever seen, it’s not bad at all for the price, with bright colours and a reasonable image quality. It’s perhaps a bit small to watch films on, but it’s comfortable to hold for long periods and it’ll do in a pinch. 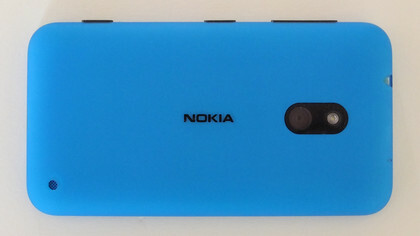 The Nokia Lumia 620 supports most of the major audio and video formats, specifically MP3, WAV, eAAC+, WMA, MP4, H.264, H.263 and WMV. And both the music and video players get the job done, which is good because there aren’t many alternative players available on the store. 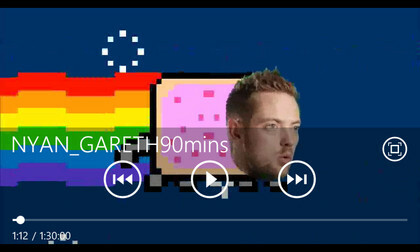 It would be nice if the equaliser settings were accessible from the music player itself, but that’s a small niggle. There’s no YouTube player or radio out of the box, which seems a strange omission, but both of these can be downloaded from the app store. Aside from music and video, there’s also a Photos’ app to view your pictures. 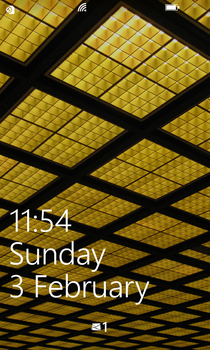 From here you can easily favourite them, upload them to SkyDrive or set them as lock screen wallpaper. There are also a handful of editing options, though you’re limited to cropping, rotating or ‘fixing’ the picture. 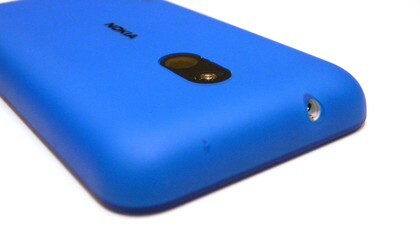 Ultimately there’s not that much to media on the Nokia Lumia 620, but what there is works pretty well. 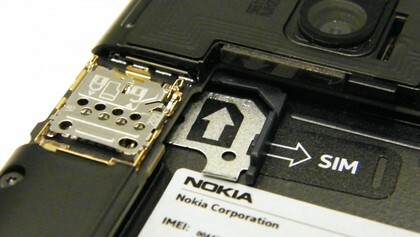 Only having 8GB of internal storage could have been a problem, but with a microSD card slot supporting up to 64GB cards, it’s possible in practice to have tons of space – more in fact than even higher end phones such as the Nokia Lumia 920, which doesn’t have expandable storage. The small screen size does mean it’s not ideal for video, and this would never be our first choice for media, but for the price it does an admirable job. We’ve been pretty impressed with the Nokia Lumia 620 in most areas – for a budget handset there’s not much that we could realistically expect it to do any better. Unfortunately, as is so often the case, the battery could be its downfall. 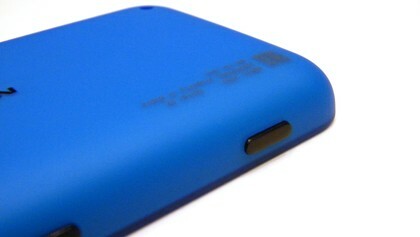 Rated at 1300mAh, it was never likely to be great, and going into this review it was our single biggest worry. Depending on your usage patterns, you might be alright with it, since the drain when the screen is off doesn’t seem too great, so if you mostly have the phone on standby, but maybe make a few calls and listen to a bit of music you should easily get through a day, probably more. If on the other hand you plan to spend a lot of time watching videos, browsing the net or using games and apps, then you can expect it to plummet. 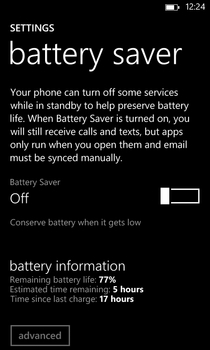 We put the Nokia Lumia 620 through our standard battery test of running a 90 minute video from the handset, with the screen at full brightness, emails and social networks set to send push notifications and the battery starting fully charged. By the end of the video the phone’s charge had dropped to 64%, in other words under those conditions you can expect at most 4.5 hours of video before the battery conks out, which really isn’t very good. You can improve that a bit by turning the brightness down or turning on the battery saver, which stops apps running in the background and turns off automatic email syncing, but we’d still hoped for more from it. On the other hand, battery life seems to be the bane of Windows Phone 8 in general, because none of the other currently available handsets seem much better, so if you’re set on Windows Phone 8 it’s a problem that might be unavoidable for now. 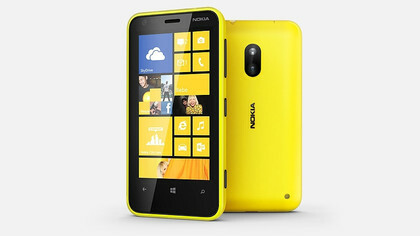 The Nokia Lumia 620 has a fairly standard array of connectivity options, specifically dual-band Wi-Fi 802.11 a/b/g/n, HSDPA at 21Mbps and HSUPA at 5.76Mbps. It also features Bluetooth 3.0, NFC and GPS. It’s all pretty easy to set up, with options in the main settings screen for turning on and configuring connections. But we do wish there was a quicker way to turn Bluetooth on and off, since it’s buried several screens deep. While acceptably fast for most things, the Wi-Fi proved quite slow at loading desktop pages, sometimes taking up to 30 seconds to fully load a page. However, when sticking to mobile sites, it was plenty fast enough. Getting files to and from the phone is pretty easy. There’s built-in SkyDrive integration for a start, enabling you to easily upload photos and other files at the touch of a button. You’ll also find some other cloud storage sites are supported by apps available in the store. If you want to get a lot of things onto your phone then you might be better off plugging it into a PC, which, once done, enables you to use it like a USB flash drive and just copy and paste files to the handset. The folder system is simple too, with clearly labelled Picture, Music and Video folders. Finally, if you’ve already got files on a microSD card you can also just pop that into the phone and get at items that way. Being a Nokia handset, the Nokia Lumia 620 comes with a handful of useful Nokia apps in addition to the standard Windows Phone 8 stuff. On the mapping front, there’s Nokia Maps, which is a decent piece of mapping software. We’re not fans of its fairly muted look, but it’s got some useful features such as the ability to download maps for offline use and find nearby places. 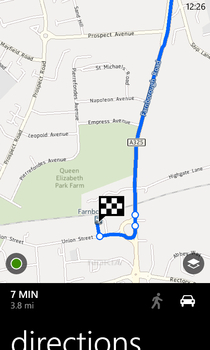 It’s also integrated with Nokia Drive, which is a pretty good free sat-nav service. It doesn’t have a ton of features, but it’ll get you where you’re going. 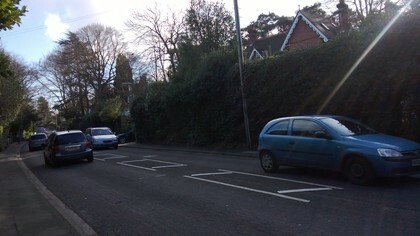 We were also impressed with how fast GPS locked on to our location, only taking a few seconds. 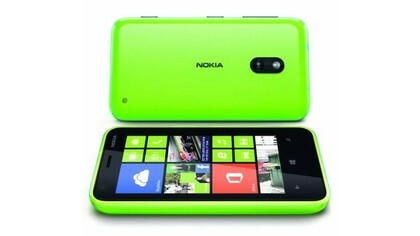 In terms of apps, the Nokia Lumia 620 comes with Nokia Music, which we talked about on the Media page of this review. Thanks to free mixes, it’s better than Microsoft’s music player. 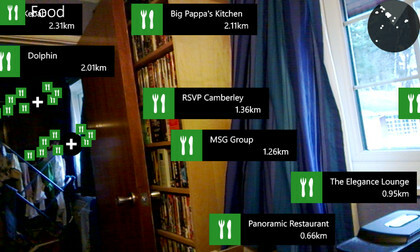 There’s also City Lens, which uses your phone’s camera to point out attractions and restaurants in the nearby area. It’s a bit of a gimmick really, since you can get much of the same functionality from Nokia Maps without making a fool of yourself, but it’s still fun. 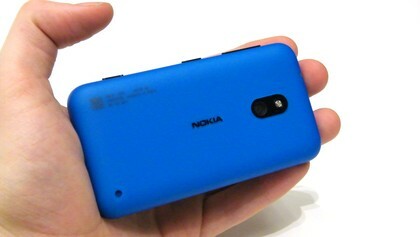 Finally and least interestingly there’s Nokia Care, which is basically just a manual for your phone. Other than the Nokia apps you get standard things such as a calendar, calculator and alarm clock, along with Microsoft Office and OneNote. The mobile version of Microsoft Office is surprisingly fully featured, with all the options for creating and editing documents and spreadsheets that you’re likely to need on the move. 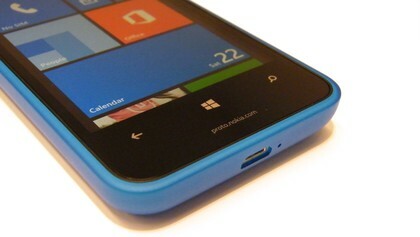 We’re not sure the 3.8-inch Nokia Lumia 620 is the best place to use it, but it’s nice to have anyway. While you don’t get a huge number of apps pre-installed, what’s there is all pretty good. 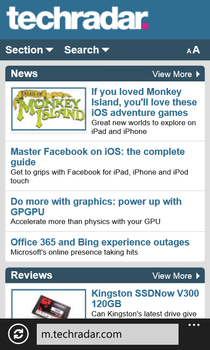 Getting more apps is simply a case of finding and downloading them from the Nokia or Windows Phone 8 app stores, and while the selection isn’t close to what’s available on Android or iOS, it’s still quite reasonable, with apps to suit most needs. For the gamers among you there’s also a selection of Xbox Live games that aren’t available on other mobile platforms, though again the overall selection of games is smaller than on Android or iOS, and with its small screen and average processor the Nokia Lumia 620 doesn’t make for the best place to play them. The placement of the speaker also means it’s very easy to accidentally cover it while playing, resulting in quiet, muffled audio. Once installed, you can find your apps by swiping right from the start screen. You can launch them from this list with a tap, or long-press them to get the option to pin them to the start bar or uninstall them. 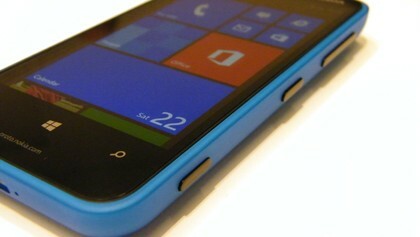 The Nokia Lumia 620 is a great little handset. While it can’t compete with most other Windows Phone 8 handsets, such as its big brother the Nokia Lumia 820 or the HTC Windows Phone 8X, with a price tag of just £150 (around AU$225/US$235) it doesn’t have to. It has set its sights squarely at the low end of the market, and its only real Windows Phone 8 competition there is the HTC Windows Phone 8S – a handset that’s pretty similar yet costs more. We still have some reservations: it’s a shame the battery isn’t better, and both the screen and keyboard are a little cramped for our liking, while its changeable, colourful shell is no substitute for the stylish, premium look of the HTC Windows Phone 8S. Plus if you look beyond Windows Phone 8 there are other low priced options to consider, such as the Samsung Galaxy Ace 2, though the specs on that can’t quite match the Nokia Lumia 620. 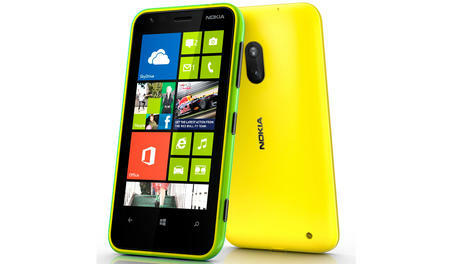 The Nokia Lumia 620 is seriously cheap for what you get. Its specs are comparable with handsets that cost £200 (around AU$300/US$313) or more and yet it can be yours for just £150 (around AU$225/US$235). Its performance is generally smooth and responsive, the screen isn’t bad at all for such a budget phone, and like all Windows Phone handsets it handles contacts and messaging impressively well. The bundled Nokia apps help it stand out from HTC’s offerings, thanks to the thoroughly decent Nokia Drive sat nav service and Nokia Music, which has all the features you’d expect of a music player along with free radio mixes. Thanks to the changeable back cover it’s also quite a lot more physically customisable than most phones, and while it doesn’t have much internal storage, with support for 64GB microSD cards, space never needs to be an issue. 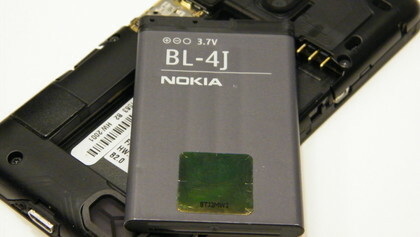 The battery is the single biggest problem with the Nokia Lumia 620. Most users will probably get through a day on a single charge, but if you plan to watch a lot of videos then you might want to carry a charger with you just in case. The web browser is also a little slower than we’d like, and being essentially stuck with Internet Explorer is a pain – though that’s an issue that all Windows Phone 8 handsets currently suffer from. We also wish that the screen and keyboard were both just a little bit bigger, since right now they can feel a little cramped – particularly when you start hitting the wrong button on the keyboard. 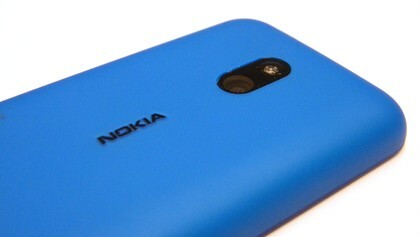 There’s not a whole lot that the Nokia Lumia 620 does wrong. As an all-round, jack of all trades budget handset it does a great job. We’d love it if the screen was slightly bigger or it had a little bit more RAM, but for the price we can’t really complain. 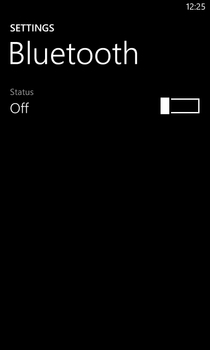 The only real issue is the battery, and that’s an issue to some extent with every Windows Phone 8 right now. 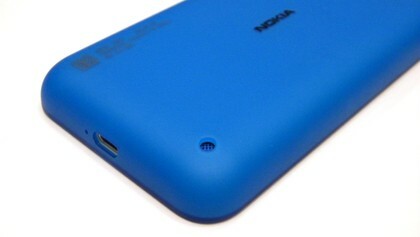 It might not have the style of the HTC Windows Phone 8S or the specs of the Nokia Lumia 820, but with a big enough microSD card it’s got more storage than either of them, and it really is one of the best value phones – particularly at the low end of the market – that we’ve seen in a long time. 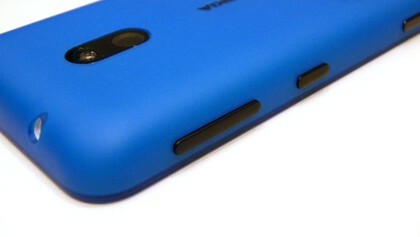 The Nokia Lumia 620 is a great budget handset. 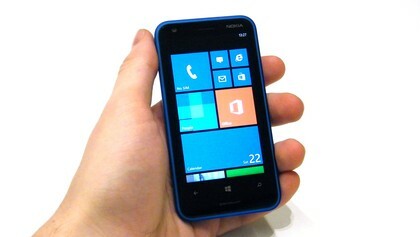 It’s also brilliant value, and the only sub-£200 (around AU$300/US$313) Windows Phone 8 option right now.